What do you do when you car breaks down or your bathroom leaks and you have to call a plumber? Put it on your credit card, right? Well maybe to get points or rewards, but certainly not financing for the long term. Following last week’s posts on where did it all go? You’d have probably realised that you need an emergency fund. Now I appreciate that you can’t magic one up out of thin air, but if you’ve followed some of the advice of the last few days, you should be starting to have a little extra each month. Using that money (unless you’ve not paid all your debt off: see how to control your debt) you want to be start providing for emergencies. And before you ask, no, an Xbox or a pair of Jimmy Choo’s don’t class as an emergency. 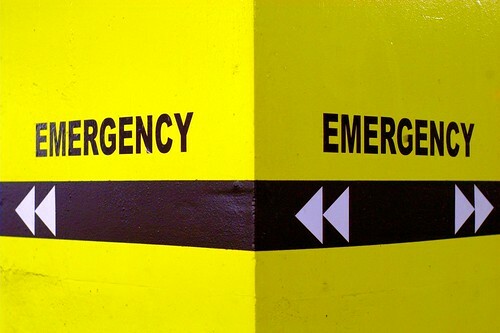 An emergency is to cope with the unexpected. For example, suddenly finding yourself unemployed and you have to cover your living expenses until you get a new job. Most experts typically recommend you can cover 3 months living expenses. ie 3 months salary for most people. Now, I appreciate that when you’re struggling to save £100/$100 a week this is a big ask. So we’re going to start small. We’re going to start with a week at a time. But before we do that you need to open an instant access savings account with the same bank that you have your salary paid into and you pay your bills out of. Now, I normally wouldn’t recommend that you keep your savings at the same bank as you run your main account, but we are not talking saving we are talking emergencies and when the proverbial hits the fan you’re going to need access to it and fast. I learnt this only the other week, when I had to transfer some funds from my savings account and because the funds had not cleared in time I incurred some charges. So when you need fast access nothing can be quicker than the online bank account linked to your bills account. When you have enough funds in this account to cover a week’s worth of expenses you need to save for the next week. Rinse and repeat until you have a month covered. For the 2 and 3rd months though, I think you can afford to wait a littler longer for your money and you need to find an account which gives you online access but gives you a better rate of interest. I normally recommend an ING Direct account which is what I use myself. Now, until you’ve got your emergency fund fully topped up you need to think about paying 5% of your monthly income into this account. Of course, the good news is, the lower your weekly and monthly outgoings the less you need to save in your emergency fund! So keep visiting the where did it all go post and keep trimming your weekly and monthly costs. Tomorrow, we’ll start to look at building your fortune.